In the previous post, we have proved the Isosceles Triangle Theorem. The theorem states that the angles opposite to the two congruent sides of an isosceles triangle are congruent. 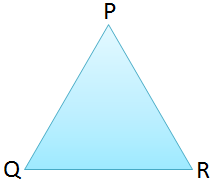 In this post, we use the said theorem to prove that equilateral triangles are equiangular. since all sides of an equilateral triangle are congruent. Now, since and , by the Transitivity Property of Equality, . So, equilateral triangles are equiangular.